State & Local Government Tax Rebates for Wood Stoves - Are You Eligible? Last month I put together a list of things I was looking forward to in Nashville and published that list in the February 23 edition of the Pellet Wire. 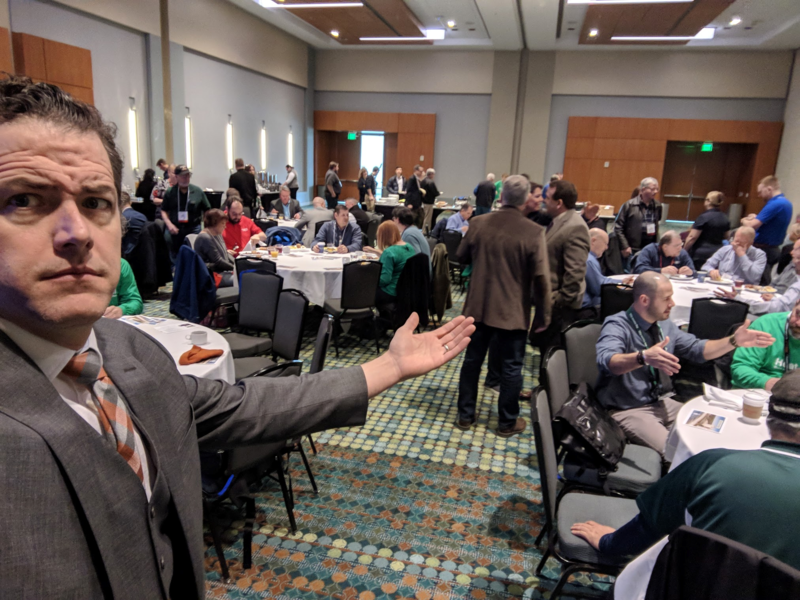 On the flight home from Nashville last Friday I reviewed that list to see how I did, how the PFI did.The early thinking is that for myself and for the PFI, our time together in Nashville was a runaway success. As I expected, there were a handful of conversations that I wanted to have but simply ran out time before I could have them. 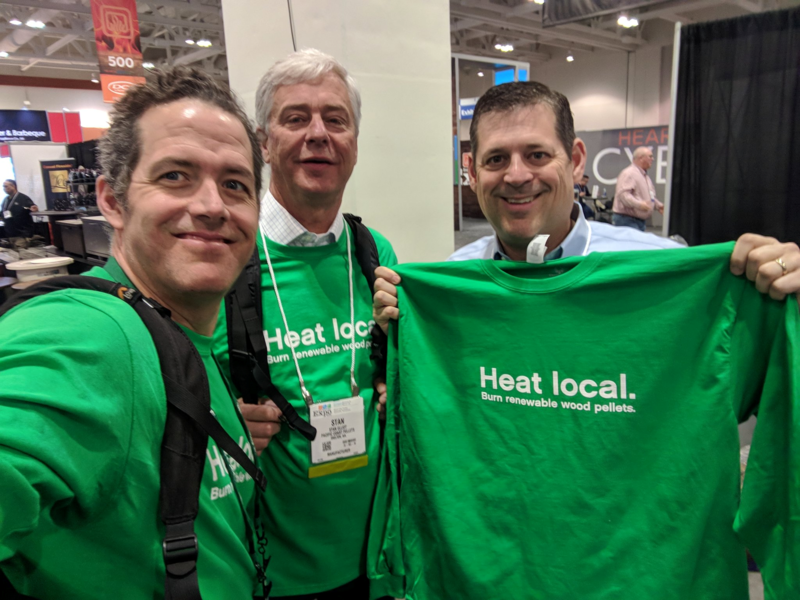 Specifically, I had hoped to catch up with some members of the hearth and home trade media I wasn't able to connect with Richard Wright at Hearth & Home Magazine. Richard, I owe you a call. The most important item on my list was what I'll walk away from Nashville the most excited about, my time with the board. In my role, I work at the pleasure of the board and their needs become my needs. I can't say enough about how impressed I am by their passion for the industry certainly, and for the PFI in particular. I was inspired by their enthusiasm for what the PFI can and should be. Also, I had a lot of fun learning more about our board members as people. Our board includes people who hunt, fish, travel, cook, spend time with their families and like what they do for a living. I even found a fellow native Iowan (you know who you are). Also important to me was raising the profile of the PFI with our Hearth & Home marketplace partners. In anticipation of our presence at the Hearth, Patio & Barbecue Expo our Promotions & Communications committee conceived of and executed a quick-turn t-shirt concept to pass out while we were in Nashville. We printed 50 of the t-shirts you see can see in the photos and we could very easily have found takers for another 50. I couldn't be happier that we did it and for everyone that took a shirt and immediately pulled it over whatever they were wearing, thank you. I noticed and it is much appreciated. The event we were all there for, Breakfast & Biomass, was a great success. Our preparations certainly paid off and I think we made it very clear that the new direction for PFI is to aggressively pursue market growth. Immediately following Breakfast & Biomass a sizable contingent of members and producer members sat down with Lisa Rector, a Senior Policy Analyst at NESCAUM (Northeast States for Coordinated Air Use Management). 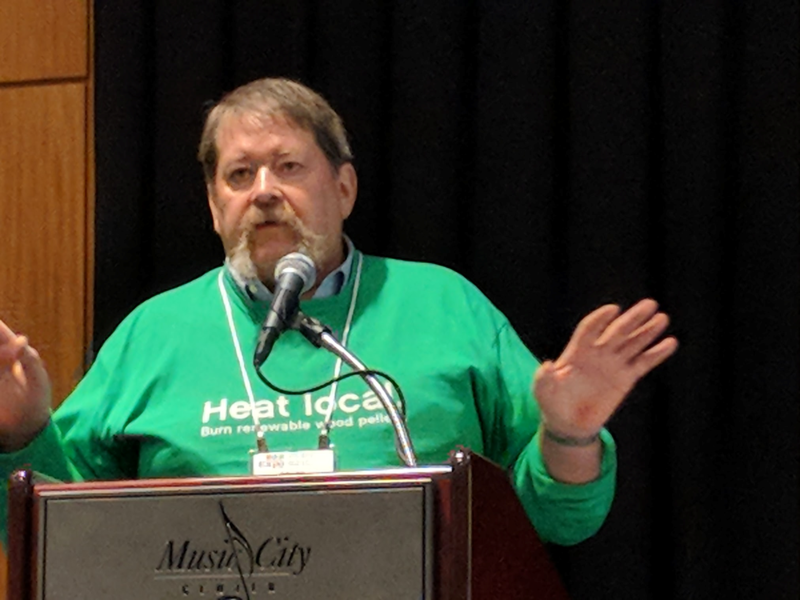 Lisa was a speaker at the PFI Annual Conference and has long asserted that increasing the percentage of certified pellet appliances in the inventory of wood heat appliances in homes in the Northeast would have positive air quality impacts. She highlighted some state-level programs, including the Renewable Heat NY program that recognizes that same fact and has incentives for homeowners twho want to replace a wood burning fireplace with a more efficient wood heating appliance, including pellet stoves. Lisa even connected her efforts at NESCAUM with our efforts in Operation 100k, which she had just heard about moments before. She gets points for that and her argument was very compelling. Finally, the time came and went too quickly. Conversations I had hoped to continue before I left will have to continue over the phone (I'm looking at you, John Ackerly). Now, it's time to buckle down and push toward our annual conference in Myrtle Beach. You can actually help me in that regard. We need some early momentum in registration, sponsorships, and exhibits. I'll be reaching out personally next week, but if you know you are going to be there, please register now. It matters. Danson's has generously donated a pellet grill for us to use as a motivator. So, for everyone who registers before March 30 will be entered into a drawing to win for that grill. Does Your State or Province Offer a Pellet Stove Rebate? The same goes for certain localities in California, Colorado, Washington, Utah, Minnesota, Pennsylvania, and Massachusetts-state and local governments see pellet stoves as a way to cut down on particulate matter released by traditional wood-burning fireplaces, and they incentivize residents to buy new pellet stoves with a tax credit. Certain conditions may apply. Be sure to check HPBA's handy resource on state and local government tax credits for pellet stoves-and don't forget to share these tips with appliance retailers, who can use these incentives to sell more stoves. Gross margin for the fourth quarter reached $25.7 million, up from $19.2 million during the same quarter of the previous year. Adjusted gross margin per metric tons was $47.43 for the quarter, up from $42.95 during the fourth quarter of 2016. Net income for the quarter was $7.9 million, compared to a net loss of $9.6 million. 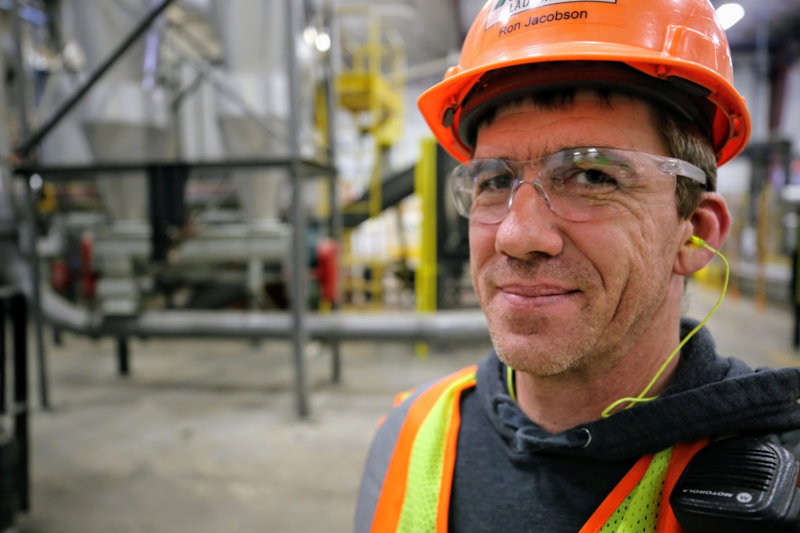 Pinnacle Renewable Holdings Inc. says it's moving forward with plans to redevelop an existing Smithers, B.C., particle board facility to produce wood pellets. Pellet stoves are one of the cheapest ways to reduce a home's carbon footprint. A perfect complement to solar panels, they could be pitched as part of a package for homes. But states need to start promoting them, as they do solar panels. Solar panels are the way of the future for millions of U.S. homes. But they aren't sized to carry the heating load of most houses in the country. A pellet stove can easily provide 50 to 90 percent of the heating needs for millions of American homes with an installed price of $3,000 to $5,000. All states that have solar incentive budgets should include incentives for pellet stoves. Many with the highest incentives for solar are ideal for pellet stoves. One of the best arguments to present to states is not just that pellets are an affordable way to reduce fossil fuel use, but that they can also reduce demand for polluting wood stoves. If states had more aggressively steered people to pellet stoves over the past several decades, fewer households would have installed old, second-hand wood stoves that are then removed through expensive stove change-out programs.